Product #177 | SKU 1495-003-110 | 0.0 (no ratings yet) Thanks for your rating! 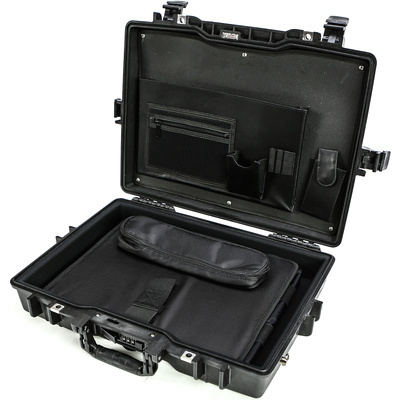 The Pelican 1495 CC1 Deluxe Notebook Computer Case (Black) is a hard, watertight, crushproof, and dust proof case made to carry a laptop computer. It has a lid organiser and fitted shock absorbing computer tray for a laptop computer up to a 17" screen. A shock absorbing laptop sleeve and accessory pouch are included. It is carried by a padded fold down handle, and an included removable padded ergonomic shoulder strap. Shock absorbing laptop sleeve is included.